The Spartan Alumni Rowing Association (SARA) is embarking on a long term capital campaign to benefit of Case Crew. We are trying to raise enough money for two shells and a shell trailer. The campaign was expanded in 2011 to include seed funds for a coaching endowment raising the campaign goal from about $50,000 to $75,000. To spur increased interest the SARA Board agreed to match any new donations made in 2011 1-for-1 up to $20,000. The student athletes on Case Crew primarily raise funds by selling concessions at Cleveland Browns games and dues. These funds are then used for all operating expenses. Once annual expenses are covered anything left over is used for equipment, and these boats are then owned by the university. Following this fund raising model the team has only been able to purchase three (3) new boats since 1995 -- clearly an impressive achievement but the team still relies on alumni and friend support to boost the competitiveness of the fleet. Since its founding in 1991 the team has never been able, financially or administratively (forbidden by the University), to pay a coach. Since the founding of SARA in 2003 alumni have worked hard to fill the gap. The financial situation of the team is tenuous at best. There are only two teams on Case's campus that must fund raise for their basic facilities: Crew and Ice Hockey. All other sports on campus are provided courts, fields and pools for their sport at no cost. This added burden for boathouse space plus the need to get to regattas every year takes a huge chunk of the team's budget just to exist -- leaving little for much needed equipment. Over the next three years, the assessment charged by the boathouse per rower will increase 30% to $220 per year and rack rents are set to increase by 20-25% over the same period. Assuming ~40 rowers, the total bill due to the boathouse will equal the price of a new double...every year. • The campaign's first priority was to raise enough to replace the Sweet J -- a task accomplished in September 2008 with a lead gift from the Hudak Family. • In June 2009 we secured enough donations to buy the team a shell trailer with lead gifts from Paul Buchheit, Mark Handloff and the Wilkes Family. • 2010 saw a hiatus in fundraising for the Alumni Victorious Campaign as we worked to help secure funds for the new boathouse. • In 2011 the campaign was expanded to include seed funds for a coaching endowment. To kick off the expanded campaign and mark the 20th anniversary of Case Crew the Board agreed to match 1-for-1 new donations up to $20,000. • In October 2011 we christened the second 4+ shell in the campaign, the Stefan James, thanks in large part to the largesse of the Bachmann family. From 2003 to 2008 (before the Alumni Victorious Campaign) SARA raised nearly $17,000. This early success prompted the SARA Board to kick off a multi-year capital campaign to benefit Case Crew. On an operating basis we have donated SpeedCoaches, replacement riggers, many necessary emergency repairs to keep the team afloat, and a fleet of small boats including two pair/doubles and a couple singles. Alumnus Paul Buchheit '98 stepped up with a leadership gift to SARA and the Cleveland Rowing Fondation Rivergate project to secure a permanent home for rowing in Cleveland. We have also stepped up to support Cleveland's national team aspirants by providing Miranda Cullins and Aaron Marcovy with brand new Hudson singles while they train with USRowing. This wonderful support has begun to make a difference and has given us the confidence that we can deliver on this capital campaign. We are also in the final stage for the Alumni Victorious Campaign. We've replaced the Sweet J with the brand new Pocock Hypercarbon 4+ and bought the team a shell trailer. What's left is the second coxed four and seed funds for a coaching endowment. 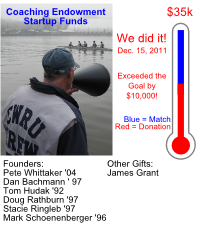 We've raised $26,000 as of January 2011 as part of the campaign. With the SARA Board commitment to match 2011 donations up to $20,000 we need to bring in another $30,000 to finish off the campaign. Please consider a donation in support of this campaign. All of your donations to SARA are tax deductible. The team is riding a wave of success on and off the water. The team continues to perform well against local and regional peers. Case Crew has dominated the Home Schools Regatta in recent years and leads the all time series for the Hammer Cup with recent wins in 2010 and from 2004 to 2008. On the national scene Case Crew has also placed boats into the semi-finals of the Dad Vail Regatta, the national championship, three of the last six years. Recent individual honors go to Miranda Cullins who is currently training with the US National Team in Princeton, NJ and Monica Ionescu who is at a pre-elite resident training program in Philadelphia. If you are an alum, how many hours have you spent hawking beer at a Cleveland Browns game? Each Browns game is a 10-hour commitment between opening prep, the game, and closing and inventory for the concession stand. The team also holds an annual erg-a-thon and many bake sales to add to the pot of funds. On top of class and practice every athlete has a specific fundraising commitment in addition to dues and paying for uniforms. Even with all this hard work, the team still comes up short without alumni support. We all know how difficult classes are at Case. However, a 2006 graduate from the team working for a major cell phone company likens his job to his duties as a regatta chair - he learned more that is relevant to his current professional life from crew than class. We all pull from our shared experience of rowing on the Cuyahoga at 5am with a dedicated coach urging us to perform at our best. Case Crew is all about hard work, life balance, lasting friendships, and finding that perfect stroke on the Cuyahoga. Let's build on the team's success by giving the student athletes and coaches the tools they need to be successful. The need for new and better boats » Accomplished! Case Crew was only founded in 1991, but this relatively short history has not prevented our alumni from stepping up to support Case Crew through SARA. We all remember the days lugging beer up and down stadium stairs or logging hours for an erg-a-thon so we all realize the need for funds. Now is our time to start making a difference and answering the question, "wouldn't be great if we had alumni that could donate a boat?". Case's peer schools on and off the water are those from the University Athletic Association (UAA) along with local rivalries from John Carroll and Cleveland State at the boathouse. The teams from the UAA meet every spring at the URA Championships, but if you see the trailers from teams like Carnegie-Mellon (team founded in 1987), Rochester (1981), WashU (1985), and Chicago (1975) you'll see that Case isn't actually in the "same league" in terms of equipment. Each of these universities are roughly the same size, are all ranked in the Top 50 academically, exert exactly the same pressures to study, and have remarkably similar student bodies. And all of their rowing teams are club programs like Case and all can pay their coaches. However, Rochester has shown up to the last couple URA regattas with brand new Empacher eights and fours (list). WashU purchased a whole fleets of Hudson 8's and 4's in 2008 along with their brand new Resolute 8 in 2007. 100% of this roughly $150,000 investment at these two programs for shells was paid for through donations from alumni, parents and friends. Chicago and Carnegie-Mellon also have large, modern fleets. These teams are given $10-20,000 each year by their athletic departments to cover operating expense so most of their fundraising can be devoted to new equipment. Chicago was given an additional $27,000 in 2007 by their Athletic Department in addition to their annual allocation for a couple eights. Case has never given the crew more than $2,000, per year, and up until 2010 was expressly prohibited by the university from paying coaches even if they had the money. It took a landmark gift from a Case Crew alumnus to convince the university to change the rule about paying coaches. It should come as no surprise that the additional resources at Case's peer schools yield more speed. With similar athlete numbers, teams from WashU and Carnegie-Mellon have won(!) multiple events at Dad Vails. Rochester typically fields bigger boats and routinely holds their own against area varsity programs like RIT and Ithaca College. Rochester's comprehensive and long lived success led the university to make their women's team varsity in 2010. All three programs also have their own boathouses and paid coaches, but are still true club programs with significant annual fund raising requirements. Before the Alumni Victorious Campaign and concerted fundraising in 2007 Case Crew only had an 8 and two 4's at their disposal. Since SARA's founding alumni, parents, and friends have worked hard to fill out the Spartan Navy considerably. The team now has a modern fleet of boats at their disposal. We believe we need to provide one more shell to "complete the fleet" and begin addressing the ability to pay coaches. The need for a trailer » Accomplished! Case Crew is the only team at the boathouse without its own trailer. It is due to the goodwill that coaches Tim & Chris have developed in Cleveland that allows the team to borrow trailers when needed. However, it has become increasingly difficult to secure trailers or space on trailers for regattas. Last year Coach Tim had to personally guarantee and drive the WRRA trailer himself to 6 regattas in order for the team to get to races. This is clearly untenable due to the risk placed on Tim and it is up to SARA to help. Due to the independent nature of SARA, we are able to buy the trailer, register it, maintain it, and get license plates. Even when the students have had the money, they could never get such a purchase approved due to the nature of the Case Sports Club Council structure and oversight requirements. » » SARA raised enough money to buy a trailer on June 12, 2009. Thank you to all of our generous donors! See below for more details. It's not rocket science to say that combining dedicated athletes with good equipment and excellent coaches results in fast crews. Since 1991 Case Crew has relied on the generosity of volunteer coaches. This generosity has been amazing, but the time has come provide the option to pay coaches and defray coach's expenses. And as we mentioned before, the university changed the rule to allow paid coaches in 2010. The university requires a minimum of $20,000 to start a permanent endowment. This fund can grow over time with added contributions and will pay out 5% annually. Jumping from no pay to a full endowment may strike some as odd. However, we can add to the endowment at very small levels once the initial $20,000 seed funds are raised. Then going forward we can fund current year coaching expenses while slowly growing the endowment as well. This is much like saving in your 401(k) where you don't miss the money as it's taken out slowly over time. The challenge is to get the seed funds in 2011. The SARA Board also believes that setting up a permanent endowment will further cement the landmark agreement between SARA and the university that resulted in a number of key rule changes for club sports. The SARA Board is stepping up in 2011. Will you? To kick off the 2011 portion of the campaign for a new shell and the coaching endowment the SARA Board has agreed to match 1-for-1 any new donations in 2011 up to $20,000. With about $50,000 total needed for both the shell and endowment this means we only need another $30,000 this year to cap off the Alumni Victorious Campaign. Please consider a donation and if you have any questions please don't hesitate to contact a SARA Board Member. Read the 2011 Campaign Letter to hear about our final push to the finish! Individual or company name prominently displayed on bow of shell. 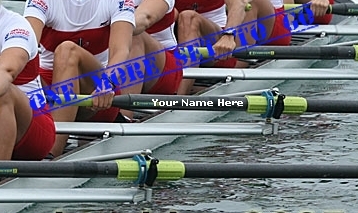 Individual or company name prominently displayed on gunwale or hull next to seat. Multiple names or class can be listed so get a few of your friends together to donate an entire seat. Individual or company name prominently displayed on oar shaft. Name engraved on brass plate installed in shell. Name listed in university announcements as a "founder" of the endowment. All donations to SARA are tax deductible. The Alumni Victorious Campaign is a multi-year initiative to significantly boost the level of equipment at Case Crew's disposal - starting with a new 4+ this spring. As such, please consider a multi-year pledge or keep us in mind with your future financial planning to achieve one of the above recognition levels. Our 2011 goal was to add another four to the fleet. Even with the first shell from the campaign, the Hudak, the team still only had two racing fours at their disposal. The other being the old Vespoli stern coxed four owned by the university. The Stefan James is a true addition to the fleet and the lead gift was gratiously given by alumnus Dan Bachmann '97 MED'02 and his family in honor of his brother. Click Here to view photos from the dedication ceremony! The shell is a beautiful 2011 Pocock Hypercarbon lightweight 4+ and is the first crew shell for the women in team history. Other seats in the shell were dedicated by Eric Matyac '94 and Doug Rathburn '97. All donors were recognized at the Speakmon Regatta on October 15, 2011. Thanks to everyone for the support. In December 2010 the SARA Board voted to extend the Alumni Victorious Campaign to include seed funds for a coaching endowment. The funds will be raised by SARA but deposited with the university. To start the fund we need at least $20,000 but can then add to the fund in very small increments over time. Once we get the fund up and running, coaching expenses will be covered with annual fund contributions and distributions from the endowment. Our 2008 goal was to replace the Sweet J, and all donors were honored at the naming ceremony held during Head of the Cuyahoga on September 20, 2008. The lead donation was made by Case Crew founder, Tom Hudak, and his father in honor of their mother and wife. Click Here to view photos from the dedication ceremony! The shell is a beautiful 2008 Pocock Hypercarbon midweight 4+. Other seats in the shell were dedicated by Stacie Ringleb '97, Mark Schoenenberger '98, Dan Bachmann '97 MED'02, and Doug Rathburn '97. Thanks to everyone for the support! The Team Can Now Get to Regattas - Thanks to You! The fleet can now get to regattas safely thanks to you, our dedicated alumni. We were able to buy a barely used Vespoli 36' Transporter trailer from Lesley University of Boston. Alumnus and SARA board member, Brian Chorney '07, coaches another small college in Boston and heard Lesley was disbanding their team team. He picked up some nice shells for his team and arranged the purchase of this trailer for SARA. We raised the necessary funds in only a couple weeks to be able to jump on the deal. The trailer was delivered to Cleveland on June 12, 2009. Thanks to everyone for the support! 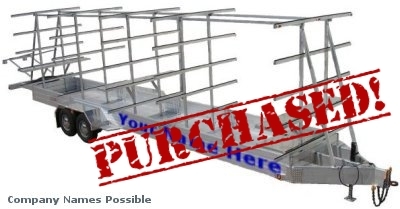 We were able to sponsor all of the racks and then some to buy the trailer. Click Here to view photos of the trailer. If you would like to discuss donation options please contact one of us below. Otherwise, please mail your donations to Fraser Hewson, Spartan Alumni Rowing Association, 31646 Electric Blvd., Avon Lake, OH 44012-2010. Please indicate whether your gift is in support of the Alumni Victorious Campaign or SARA annual giving.